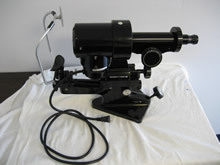 Bausch & Lomb Keratometer is one of the better manual units for measurement of corneal curvatures. This Keratometer measures concave surfaces for contact lens fitting. Both major and minor meridians can be measured once the major axis is located. Easy elevation and lowering allows quick patient positioning. 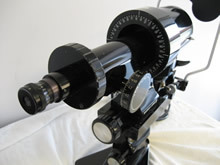 Other features include engraved focusing scale, coincidence focusing system, single position measurement in both meridians. Dial readings are shown in both diopters and millimeters for maximum convenience, converting both corneal and contact lens measurement. Unit is complete and in excellent condition. 1 year warranty on all parts and equipment !!! or fill out our Quote Form and someone will be in touch with you shortly.